Small, sweet and juicy, British strawberries are at their best over the next couple of months - and these little tarts show them off to perfection. Their cases can be made a day in advance, but are best filled on the day they are served so the pastry doesn't soften. Bake for 10 minutes, then remove the foil and bake for a further 4-5 minutes until the pastry is lightly golden. As soon as they have cooled enough to handle, transfer to a wire cooling rack. 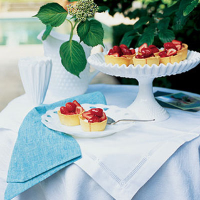 Stir the icing sugar and vanilla extract into the crème fraîche and spoon into the pastry cases. Halve the strawberries, leaving any small ones whole, and arrange on top. Melt the redcurrant jelly in a small saucepan with 1 tablespoon cold water. Brush over the strawberries until generously coated.